Sunday’s column reports on the Metropolitan Transportation Authority meeting from Thursday, at which the Gold Line extension to Claremont was discussed. The board declined to add it to the MTA’s list of Measure R-funded projects, meaning that until or unless that action is changed, we won’t see the Gold Line until sometime after 2060. That certainly puts the brakes on things, doesn’t it? Did you know Pacific Standard Time, the Getty-sponsored series of museum shows about Southern California art history, is back this summer? Not many do, it seems. 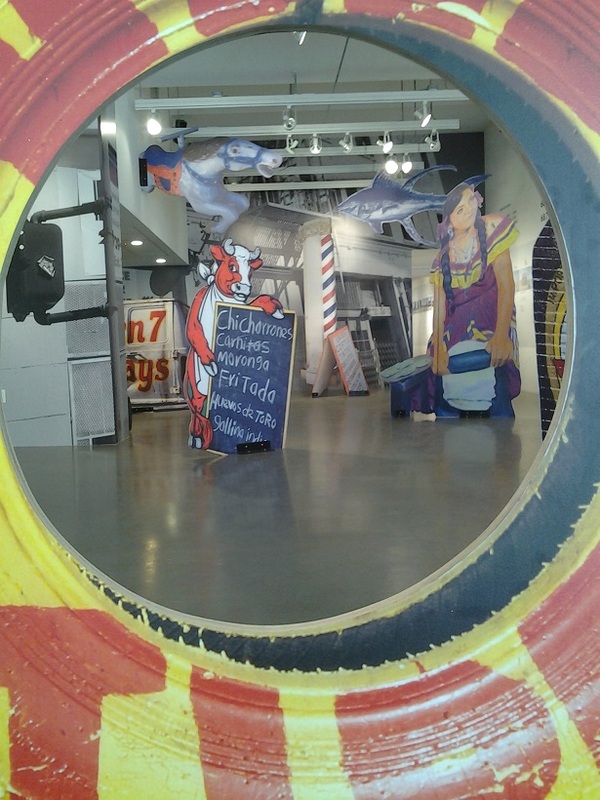 This time the focus is architecture, roughly 1930 to 1980, and 10 arts institutions are involved. I’ve been to two so far, with hopes to see more. Friday’s column has more. 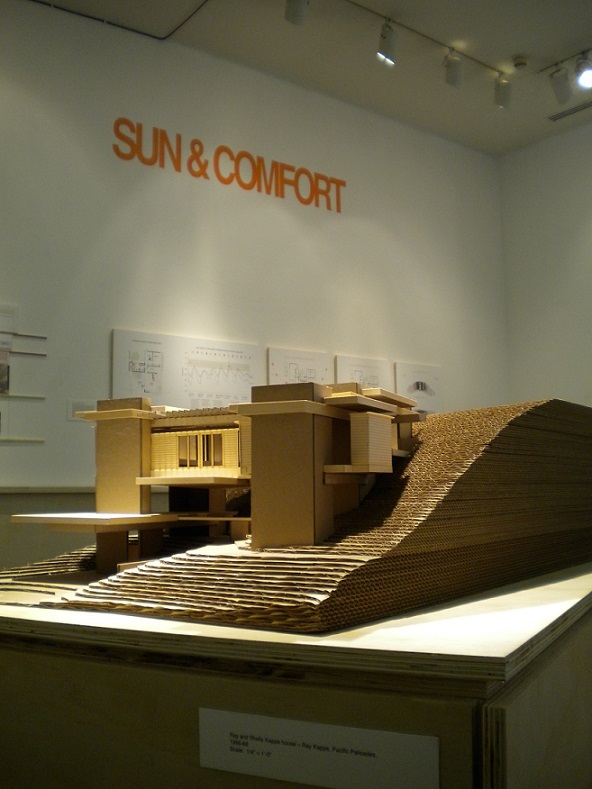 Above, a view of the A + D Architecture and Design Museum show, focusing on Beverly Boulevard; below, a model of the Ray Kappe house at the Kellogg Art Gallery show at Cal Poly Pomona. 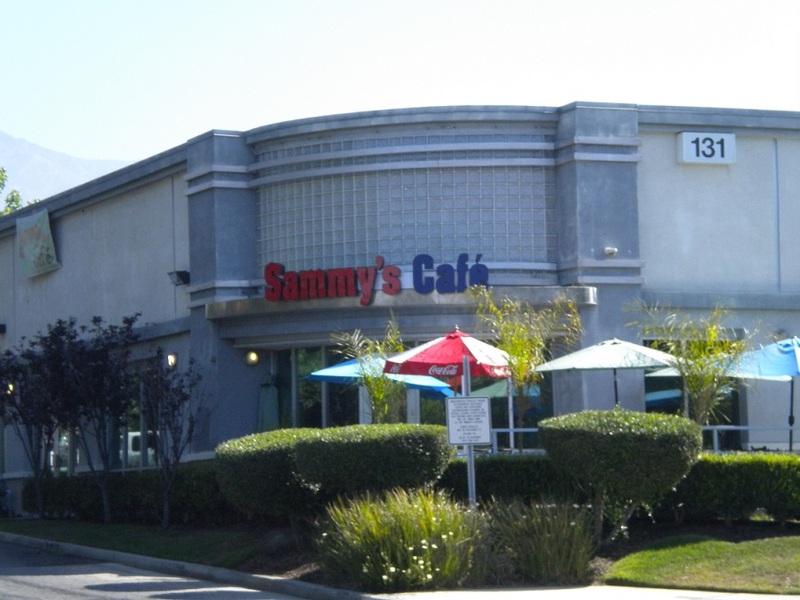 Sammy’s is a locally owned American-style breakfast, lunch and dinner spot that took over a former Baja Fresh in 2012. I’ve been there for lunch a few times. Generally I’m among the youngest customers. It’s that kind of place. But there’s nothing wrong with that. 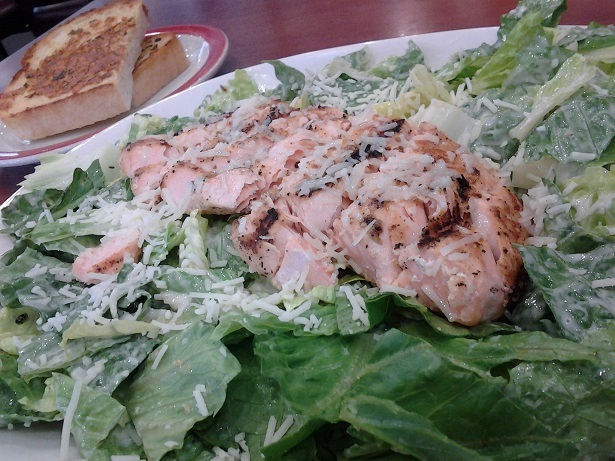 Oldsters love diners like this, and Sammy’s does a decent job, at least with the items I’ve had: a salmon caesar salad ($9, below), a tuna melt and, if memory serves, a chile colorado plate. The results seemed to me to match or better comparable restaurants. A friend in the restaurant business says the breakfasts are good. The interior makes the best of an odd and almost teardrop shape, the seating is comfortable, the service friendly. One mistake is the counter, evidently unchanged from the days when you ordered there at Baja Fresh: The lip extends only inches beyond the base, so even though they have seats there, there’s nowhere to put your legs other than sideways. But it wouldn’t be a mom-and-pop place if it wasn’t individual. Fairplex has offered me a family package (admission for four, $60 value) for its Kaboom! fireworks show, which you won’t be surprised to learn is July 4, to be given to readers in whatever fashion I choose. “The evening features monster trucks and motocross stunts as well as one of the largest fireworks displays in California,” says Heather Tanji, communications associate. Rather than ask you to be the seventh caller to my blog, let’s do it like this: Share a favorite memory of fireworks shows past, from whatever venue, state or time of life you wish. Best story (at my discretion) gets the package. A winner will be named Friday morning. This is new to me, too, so we’ll see if this idea goes well or goes Kaboom! Above is a 1:28 video from the 2007 show. Not much happened at Monday’s Upland City Council meeting, but it was entertaining in its irrelevance, including a gaffe involving a new local chain restaurant. You can read my report in Wednesday’s column. 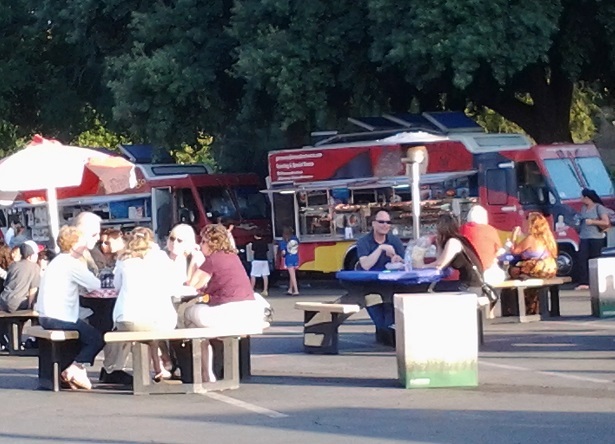 Food Truck Thursdays at Fairplex. The website The Daily Meal has compiled its picks for the 101 Best Food Trucks in America. The list roams from New York City to Los Angeles, Seattle to Miami. One surprise is how many list-worthy food trucks they found in Nashville, Tenn., and St. Louis, Mo. Even Wichita, Kan., made the list. Food trucks aren’t a California phenomenon. The No. 1 choice is from the Big Apple, but 16 L.A. trucks are represented. And if you live in the Inland Valley and are diligent about it, you could have eaten at most of them without leaving the 909. No. 2 is Kogi BBQ, which sends a truck to Pomona nearly every Thursday, where it parks at Temple and Pomona boulevards near Cal Poly Pomona. I’ve had food from most of the rest, including the Buttermilk Truck (No. 12), the Grilled Cheese Truck (No. 22), Crepes Bonaparte (No. 46) and Ludo Truck (No. 52), which have shown up at Food Truck Thursdays at Fairplex, the L.A. County Fair, the weekly Claremont Craft Ales event and/or the food truck festivals at the arena in Ontario. Food trucks also show up at local school fundraisers and other such events from time to time. I know I’ve seen India Jones (No. 73) and Nom Nom (No. 51), but haven’t tried them yet. Haven’t seen the Border Grill truck, although I know it’s been to Claremont once. I’ve also had food from the Lobsta Truck (No, 56), but that was in Long Beach. Tasty lobster rolls. I should lobby some of those St. Louis trucks to rumble out my way. Have you been to any of the trucks on the list, here or elsewhere? 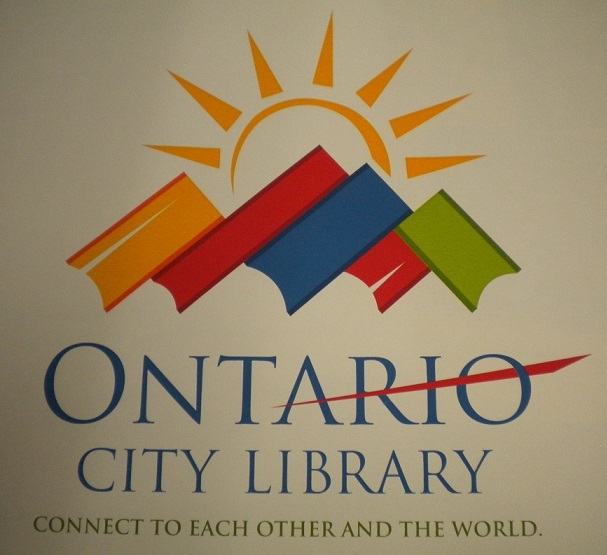 The Ontario City Library has a new(ish) logo. Playing off the city logo of a sun rising over mountains — an image that looks suspiciously like the one for Folger’s coffee, by the way — the library version substitutes book spines for mountains. Neat, eh? Credit goes to library staffer Barb Gonzales. Why it’s new(ish) rather than new: Librarian Helen Fisher gave me a copy of the logo last time I visited, which was earlier this year, maybe February, and I, er, sort of forgot about it until finding it on my desk the other day. Roberta is back at Roberta’s Village Inn in La Verne, although as manager this time, not as owner. She sold the business in 2009 but now is working there full time again. In a second item, reflecting the rapid changes in the newspaper industry, the Daily Bulletin has junked its presses. (We’ve been printed elsewhere in recent years, but now there’s no going back.) I pay a fond farewell. Read all about both these items in my Sunday column. After a decade as Super Bowl Thai, this restaurant was bought by the people who own Mix Bowl, a Thai restaurant in Pomona. 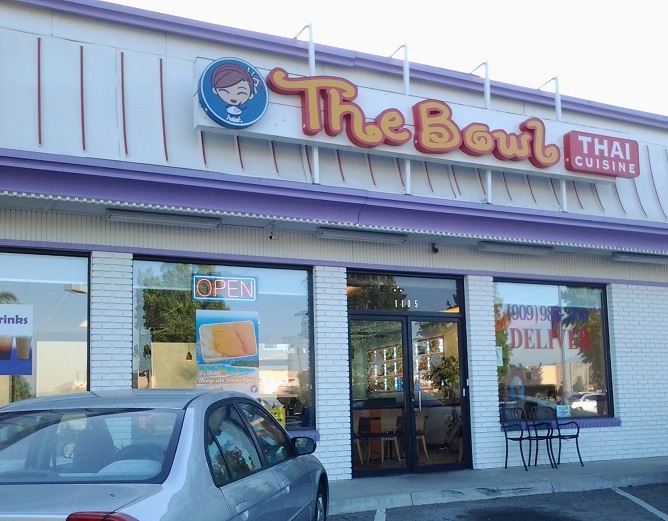 They renamed the Ontario location simply The Bowl and gave it a similarly cutesy mascot. (This one’s a woman. The Pomona mascot is vaguely boy-like.) Don’t ask me where “bowl” comes from: Other than a few soups, everything is on a plate. A friend and I went there for dinner recently. Weird coincidence: Based on the design and roofline, both The Bowl and Mix Bowl appear to be in former Wendy’s locations. Interesting business model. The server recommended the curries. 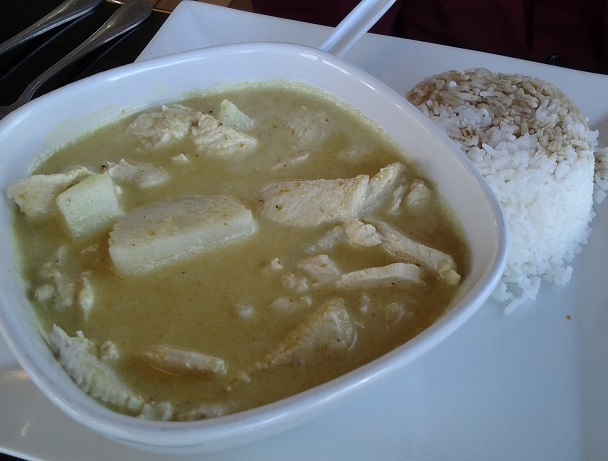 We split a yellow curry with chicken ($8, bottom), which incidentally was in a bowl, and one of the specialty items, Bowl Noodles with chicken, spaghetti noodles, onions and tomatoes ($9, below), which arrived on a plate. We liked both items, neither one of which is on the Mix Bowl menu. As with Mix Bowl, this is what you might call the diner version of Thai food: It’s not fancy, and it comes out of the kitchen fast. Service was friendly and attentive and nobody chased us out when we were lingering. 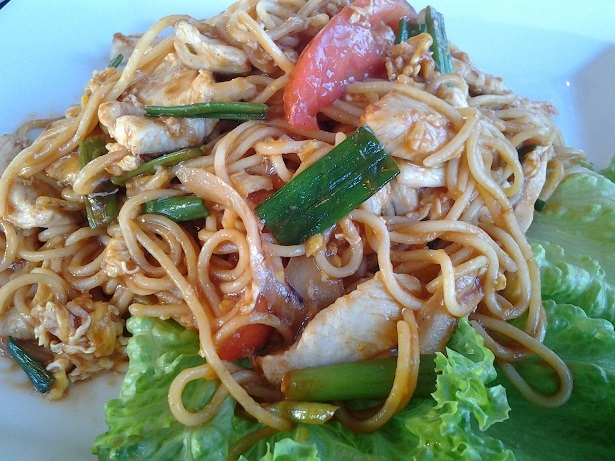 You might prefer Lucky Elephant, which is exactly two blocks north on Mountain, both for its food and elaborate decor. I do. But The Bowl is a pleasant surprise, and I’ll return there too. It’s a little more casual and a little more fun. Faced with bullet-pointed items stacking up in my computer, I blow ’em all out in one swell foop in Friday’s column, perfect for the attention-impaired.